Modifying your home to accommodate a wheelchair user doesn't have to be expensive, but there are some basic modifications that need to be done so that the daily life of the wheelchair user is as independent as possible. Be it for a child that is wheelchair bound that will grow up in the house or for an adult who recently required a wheelchair for mobility, they would like to carry on as independently as possible. They will still want to take a shower on their own, or just freely move about the house without having to depend on any one else for the basics. The following tips will help to make your house wheelchair friendly without having to spend an excessive amount of money in upgrades. Use concrete on the road surfaces that lead to the house, this makes the path weatherproof and it can be used in any season. Avoid soft surfaces like carpets or rugs as they hamper maneuverability. Make sure there is enough space around furniture and tables for the wheelchair to easily move around. A bump rail is an absolute necessity as it protects the wheels on the chair and minimizes any scrapes or impact damage to the walls. The accessible ramp to the front door should be at a shallow gradient to prevent excessive strain on the user when entering or exiting the house. Doorways need to be wide enough for the wheelchair and user to so that the user can easily fit through without bumping their elbows. For narrow doorway inside the house, think about removing the frame and leaving an open plan area. The user won’t have to be constantly opening and closing doors. Change any knob door handles to lever handles, as these are much easier for the wheelchair user to operate. Install protectors on the door edges to protect the door and frame from the continual banging by the chair's wheels. 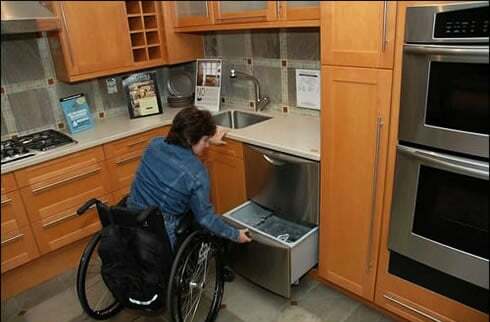 Kitchens need the most work to safely accommodate a wheelchair user and can often require a total redesign. There are some things you can do to make it more livable until a major redesign is carried out. Move everyday items like snacks, food, cups, dishes etc to a lower level. Change any appliances that have top-level controls, like the stove or oven, to those that have controls at the front. This will make it much easier and safer for the wheelchair user to operate. The bathroom will require the biggest upgrade and you will probably have to spend more money here than in the kitchen. Always keep in mind the dignity and independence of the wheelchair user. Install a toilet bowl that accommodates a commode wheelchair. Install a water-operated seat, which is adjustable in height to make getting in and out of the bath or shower a lot easier. Other modifications could include grab bars next to the toilet, and on the walls in the bath or shower. Slip resistant materials should cover the floor in the bathroom and in the shower or bath stall to prevent slipping by either the disabled person or someone assisting them. These upgrades don’t require a big investment at the moment, but keep the person in the wheelchair in mind when making any major future renovations.